Isaac, my oldest baby, started school this year. And it just so happens that he is also my pickest eater. I had been a little anxious about a number of things about him starting school (and being away from me all day...sniff! sniff! ), not the least of which was packing a nutritious lunch that he'd be sure to eat. We've had some trial and error so far, so I thought I'd share a few of the things that have been working for us. The bento box lunch craze is everywhere. We don't use true bento boxes (and I don't have the patience at 7am to make his lunch in to a work of art), but I bought large divided tupperware that fits in his insulated lunch box. He likes it because the foods don't touch one another, and I like it because we made a deal that each section needs to hold a different food group. I found these ones at Marden's for $0.79 each (love that place! ), but most places sell them in all shapes, sizes, and price points. It's not a problem to get fruit in to this picky eater at home, but he doesn't like if a banana gets a bruise in his lunch box. He prefers his apples sliced, and doesn't like the browning (or the taste of lemon juice) on them in his lunchbox. That left us with grapes (which half the time cost a fortune), and berries (which are hard to find in good quality in the cold months). 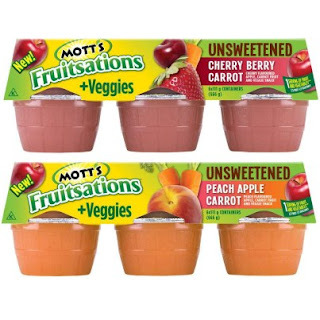 I discovered Mott's Fruitsations +Veggies, and they've been a hit. They have been on special for $1.97 at our grocery store, and I have a stack of $0.50 off coupons, so I stocked up. It ends up being $1.47 for 6 (or $0.24 each). They are unsweetened and contain 2/3 serving of fruit and 1/3 serving of veggies...and, in Isaac's mind, it's a treat. Win-win! Superstore carries these New York Style mini bagels (I haven't been able to find them anywhere else), and they are the perfect quantity for Isaac at lunch. He takes a blueberry mini-bagel with cream cheese on it and finishes it every time. When it comes to eating vegetables, Isaac is a senior citizen. He likes boiled carrots, steamed broccoli, peas, corn, and mashed potatoes. None of those options would work for a lunch box, so we had to get a little creative and try a few new things. Guess what ended up being a hit for him? Matchstick carrots! (and he likes peeled and sliced cucumber in there too) We round that out with a yogurt, and sometimes some sliced cheese. He takes water in one of these kid-sized Contigo bottles (available at Costco for $17.99 for 4), and they have never ever leaked. That's how we've been making a picky eater's school lunch work for us. What works for you? I'd love to have some new ideas to try!